Location: Around 31712 Broad Beach Road, Malibu, CA 90265, running parallel to the PCH from Encinal Canyon to Lechuza Drive. Use the access path at the corner of Bunnie Lane and Broad Beach Road. The gate is small and partly hidden by overhanging trees. Look out of the brown official sign. Alternative entrances are at East Sea Level Dr. and West Sea Level Dr where you can drive almost all the way to the shore, but along quite private looking (but in fact public) drives. West along the coast from Zuma, past Broad Beach, is Lechuza beach. The long stretch of sand includes an official state beach as well as other less formal but of course still public areas. The narrow shaded paths to the beach are signed with the standard brown state beach signs. The first entrance is in line with Bunnie Line and is at 31700 West Broad Beach Rd. With few visitors, the beach feels very private and is a stunning experience. The path to the beach is steep with wooden steps and handrails and is quite narrow at times. The overhang of bougainvilia makes the walk to the beach very pretty. According to the Mountains Recreations & Conservation Authority (www.mrca.ca.gov) the beach has public access but there are rules to obey as well. No smoking or fires are permitted, nor are any alcoholic beverages regardless of containers. Dogs are forbidden, even on leashes, although you will see locals walking their pooches here sometimes. And of course, littering and dumping are prohibited. Be aware that there are no lifeguards at the beach and due to the riptides and submerged rocks only strong swimmers should enter the water. The beach is officially closed from midnight to 6am. The private back yards of beachfront properties extend right out to the beach, and many look like sidewalks connecting the buildings. A cluster of rocks a few yards from the beach are a great place to look into tidal pools, and you'll probably be sharing the rocks with some local seabirds who are after crabs! While it is a public beach and officially maintained there are no actual facilities here. You won't find lifeguards, restrooms, or anything like that. 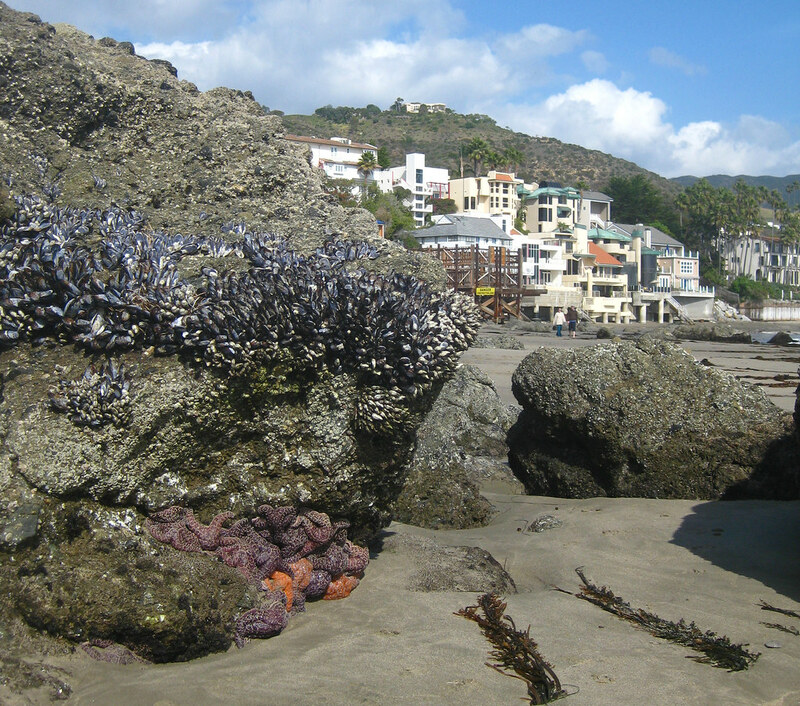 Though it's a good place for tidepooling and for just chilling in the quiet..
As there are no facilities like restaurants or cafes here you should come suitably prepared. Here is Lechuza Beach on the map.